Natural hydraulic lime (NHL) is used to create mortars and plasters which are generally more sympathetic than sand/cement mixes. This is particularly beneficial for use in traditional buildings. Secil Natural Hydraulic Lime is certified to the current version of EN 459-1. Nothing is added to the raw material.... it's 100% burnt limestone! Natural hydraulic lime is supplied in three European classifications: NHL 2, NHL 3.5 and NHL 5. These grades are based on the compressive strength of laboratory mortars at 28 days. They are also often termed 'feebly hydraulic', 'moderately hydraulic' and 'eminently hydraulic'. However, these descriptions can be misleading as the qualifying strength bands for each classification overlap (see below). The strength of lime mortar or plaster also varies depending on the manufacturer and origin of the lime. As a result, some NHL can be high in the qualifying band and some can be low. Strength can also vary depending on the ratio of the mix and the type of aggregate used. Useful for building with stone or brick where an early set may speed up construction. Secil started business in 1930 and has made a huge contribution to the construction market in Portugal. Natural hydraulic lime is a unique binder as, although it sets with water, it also carbonates with air, but for a longer period. 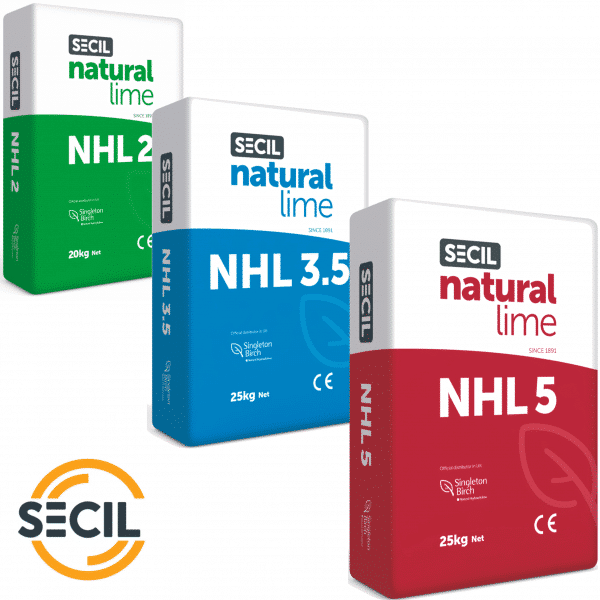 Secil NHL offers great quality for those using powdered lime in their work.